After some warming up, for me and my hifi, with some songs from Willie Tee and U-Roy, i started with the b-side of Sticky Fingers. I have to agree with the sentence from the Uncut Magazine review, that it is not so much an sonic upgrade as a deepening of the sound. Sticky Fingers japanese SACD (2011) sound is amazing. And the guy who did the half speed remastering used some hard drives with the DSD masters done few years ago at Abbey Road. Edited 2 time(s). Last edit at 2018-06-15 17:15 by Massimo68. They were done at FX-Copyroom in London (Acton W3 7XS, Telford Way). Where is the download card? I have been through everything in my box and can't find a download card anywhere. 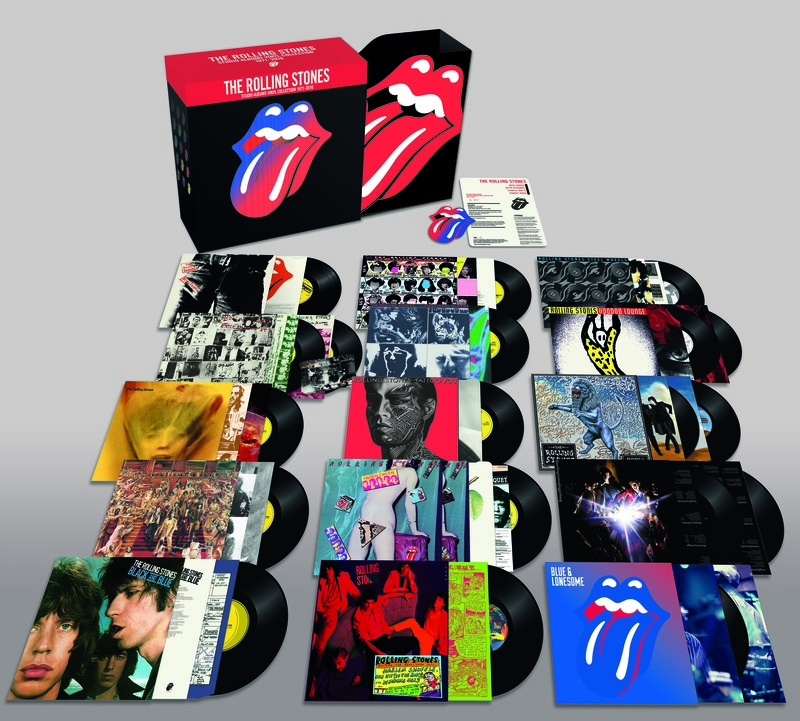 The download card would appear to be the small red, white and blue tongue logo card shown on rollingstones.com. But my set includes no such card. Who do I contact so that someone can send me the download code? I bought my set from popmarket.com. Their listing for it states that the download code is part of the package. But it apparently isn't. Edited 3 time(s). Last edit at 2018-06-17 00:19 by ab. What Bigger Bang sound like ???????????????????????? Looks like it's not available in North America as it was stated in a early press release - [iorr.org] . Seems to be true since there're similar complaints about no Download-Card on [Forums.SteveHoffman.tv] - [Forums.SteveHoffman.tv] - [Forums.SteveHoffman.tv] - [Forums.SteveHoffman.tv] - [Forums.SteveHoffman.tv] . "Just a word on the download thing for those who have had queries - it is only for MP3/Wav and is on the back of the tongue card." - [Forums.SteveHoffman.tv] . "There is no small tongue. The download code is on the white card shown in the picture. There is a larger black card with the set number on it. The 2 cards in my box were between Blue Lonesome and whatever album was before it. Bang I think." - [Forums.SteveHoffman.tv] . "My previous download cards have always been stuck to an album towards the bottom of the box, and it was just a piece of paper, I had to take all the lips out to find it." - [Forums.SteveHoffman.tv] . "This is all madness in my opinion and re downloads we are going back to when the Beatles went down to Liverpool docks to get the latest USA rock n roll imports from sailors on the ships!" - [Forums.SteveHoffman.tv] . Is the download card in the Amazon UK boxes? Did anyone in the US get the card? You can see the download card in the unboxing video above. Keith hold it in his hand, the little tongue. I looked in horror seeing Mick throwing those albums out of the box. With my luck I probably get that box! Arggl! WHAT'S the record Mick takes out after Blue & Lonesome? It LOOKS like a 10" single, not a 12" record.? This is no record - it's the description-card as it can be seen here: [iorr.org] or in this large picture. I didn‘ t listen to this record for some years. Today i listened to the a-side. The new vinyl is, for my taste, too thickened in the lower range. I prefer my old vinyl which had more air (hope you know what i mean). Than i listened to the available new download. For me it‘s sounds like my old cd rip (can ´t remember which version i had, but i guess it was the virgin one - i haven ´t cd ´s anymore). The download hasn ´t the organ in the beginning of mixed emotions, but the new vinyl has. My favorite is the old vinyl. Edited 1 time(s). Last edit at 2018-06-16 17:40 by dubclub. I don‘t have no old vinyl of this record. I just listened to the b-side of the new master - streets of love up to biggest mistake. Better than the cd version, but nothing really special. Then i compared, about 8 times each version (new download vs. my cd rip), the first minute of streets of love....no comments please. You can see how Mick is interested by the past, only if he gets money with! Not that I'm defending Mick but just maybe he was trying to look cool by throwing the records around. But to be honest my first impression was he can care less so why should I. Well, again to each is own I guess. I'm not buying this. Not that I'm defending Mick but just maybe he was trying to look cool by throwing the records around. I will: maybe this 'Unboxing'-Video shouldn't be taken serious but watched with a kind of black humor in mind - then it's funny. It starts with Keith, looking on the Box: "Bloody hell, there's a lot of sh*t on here!". Then Keith about EOMS: "That's a good one" and Mick replies immediately: "They're all good!". Charlie looks as if he sees LPs for the first time. Mick throws the LPs just on the table and Charlie is astonished about the Box-content: "Oooh!, Aaah!". Finally, Mick says: "All it needs is a turntable." And Charlie asks: "A whot?" I get and love dark humor. For instance Monty Python and my personal favorite Faulty Towers. Damn I love that show from here to the moon! 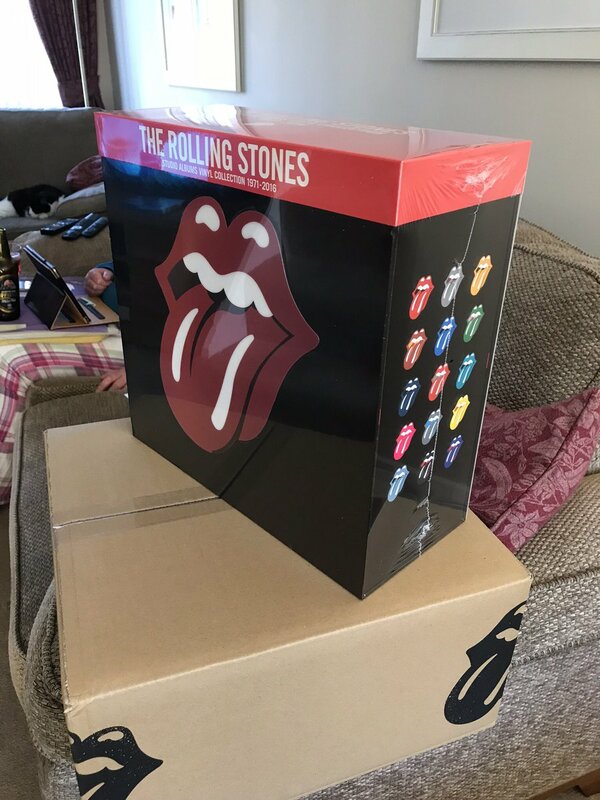 Beware, when the courier brings your box with The Rolling Stones Vinyl Collection 1971-2016. Take a good look to the delivery box whether it has not been damaged, if it is damaged there is a good chance that also the Vinyl box is damaged, see photo. I've had that happen before, and whether or not the vinyl is affected, it still hurts! Edited 1 time(s). Last edit at 2018-06-28 11:15 by UrbanSteel. Yes, I know, I got one like that myself yesterday. I will send it back this week and already ordered another one. It looks like Steel Wheels is from the same remaster found on the 2015 Japanese shm-CD. Not the original master.